Capt. 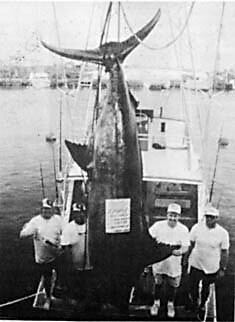 Gene Vander Hoek of the 39-foot Rybovich SEA GENIE was pulling a Joe Palacat Lunger in his lure pattern when it caught the eye of a 1144-lb blue marlin. The marlin attacked and Mike Banks soon found himself in the fight of his life. For the next hour and 40 minutes, Mike and the marlin were connected by 130-lb test line.